Rate this Article Virtual Reality has reached the point where it can now be marketed commercially. Any new technology will have certain disadvantages that have to be ironed out and VR is no exception. The use of VR devices is increasing on a daily basis as more and more people are acquiring the technology or simply getting to know and use it. VR has a wide range of applications not only in the gaming industry but in science and medicine as well. To every technology, whether new or tested through time, there are always advantages and disadvantages. Most of them however have their disadvantages brought down to the tolerable or minimum by the continually testing and updating of the technology. Take the case of the airplane. Who ever thought that that gliding contraption built by the Wright brothers would be improved over and over to the point it could carry passengers and fly at such speeds and even end up carrying astronauts to outer space. After all, the space shuttle is an airplane of sorts. Likewise, Virtual Reality is a new technology and we can expect a lot of improvement and resulting innovations to come. The Virtual Reality we might have in the future would probably be a little or quite different from the headset dependent reality we have today. Speaking of headsets as these are new devices or contraptions, there are bound to be some issues with regards to their use and the technology that comes with them. Let’s take a look first at the hardware or the headset itself. The enclosed effect it gives the user, the possible effect and danger of the lenses that can cause the human eye rapid movement causing eyestrain and what not. The weight of the device and whatever effects that can occur by having it strapped to ones face for long periods of time. Some people might even be crazy enough to go to bed with the headset still strapped on. 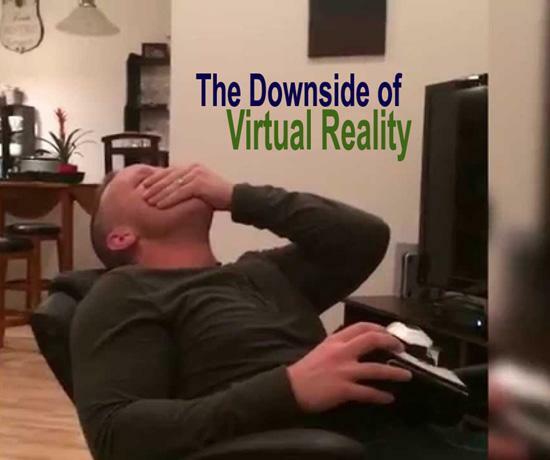 Watching a VR movie or a calming simulation might have a user snoring in no time where the user is in a world that gently sways him or her to sleep with a lullaby tune or something to that effect. Enclosed effect – we all know that once you strap that thing on your face (especially the Vive and the Oculus), you are totally cut off from your real physical surroundings. When you run the VR program, you are in that world. What you see is not what is really in front of you and without safety precautions or someone around to check on you, well…something physically painful is probably going to happen. Of course you can’t see the stairs, it’s a beautiful field filled with flowers and that sweet girl smiling at you. Yeh, right! Have a happy landing. Eye Contact – In VR headsets, the standard distance of the lenses to your eyes are 2 inches,(that close). Well, you won’t notice it, especially when they start displaying the virtual world simulation or game you’re supposed to be in. VR is still commercially new and in the developing stage which means, the software isn’t perfect yet. Well, some are safe, those that do not require a lot of movement, but try Counter-Strike in VR and let’s see you puke after a few heavy rounds with D boys. In VR, our eyes have to re-adjust and move fast enough to follow the events that are happening in the simulation. Our 2 eyes don’t have the same exact focus in the real world and what we see with each eye has to be synced by our brain so our vision shows as one. Some VR software still haven’t perfected this synchronizing effect though you won’t probably notice it. What you will notice is your headache and eyestrain. At times, the frame rate cannot cope up with the movement or rotation of your head. The depth and distance effect or illusion is another thing to consider. All of these will put the strain in your eyes. The manufacturers themselves are continually working to perfect this and are very cautious with their warnings. Lagging frame rates can cause nausea and having to adjust your focus from far to near objects or staring at nearby objects can be taxing to your eyes. It’s like playing RTS where your eyes keep following your tiny whinny men around and around the battlefield and your eyes hurt after several hours. In VR it’s faster, it takes minutes to wear you out. VR apps can really be immersive. Of course scientific, educational, industrial and medical uses have specific time limits of VR use and are done mostly in supervised conditions. Aside from tutorials, VR is currently being used to treat emotional and psychological conditions and will likely be used to treat both eye and brain defects in the future. What is worrisome is the application to gaming and entertainment. These applications are highly immersive and may totally cut-off the user’s sense of the real world. The headset might not be designed for really long periods of use. Hard plastic and rubber combined with sweat can cause some skin irritation in some people. The weight of the headset may cause your head to droop so low and may cause damage to your neck or spinal area (as if sitting in front of your computer all day isn’t damaging enough). Some people might fall asleep with the headset on. This may cause accidents, we don’t really know but, there’s always a first time. As for the software or VR apps, as mentioned above, the possible effect to ones optic faculties or even the brain may cause discomfort. Most of all would be the possible effect to your emotional well being and the way you think. Software developers especially for games will have to develop VR simulations according to some standard and rate them accordingly. When you run a horror game in VR, that ghost or Zombie really pops out at your face. That ugly MF is staring 2 inches from you and it’s a good thing it’s VR or you’ll probably smell that nauseating breath. VR has the uncanny ability to make you laugh, cry, fall in love, get angry or scream as loud as you can in fear. No exception, unless of course you’re Daredevil. All this put together and the enclosure in a totally other worldly environment can affect the way you think and feel especially if exposed to it for long periods of time. Try using a horror VR game day in and day out and you’ll probably find yourself screaming in your sleep. VR worlds can be so real that some people might end up having a hard time distinguishing fact from fiction. There are probably more issues that will appear and plague the VR industry but as they perfected the airplane, so will they with VR. The issues we have today can be viewed as part of technological progress and VR is a very promising technology that should be developed and improved to the fullest.